Popcorn machine makes delicious popcorn ready in 3 minutes! Do you want to enjoy delicious homemade popcorn from home? You need the Beper popcorn machine! This electric popcorn maker looks fabulous in any kitchen even when it’s not in use! It’s retro design compliments any cooking space perfectly, especially those with a bit of a vintage twist. Popcorn is a very social snack, you can sit and enjoy a bowl of it while watching a movie with the family. The kids will love watching the kernels POP too! The mechanism is simple. The popcorn maker heats up and once the air is hot enough it passes over the kernels. They then POP turning into the indulgent snack we love. With its vintage look and easy to use technology you can always enjoy warm, scrumptious popcorn from the comfort of your own home! What could be better? 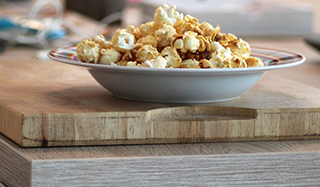 Use with the Handy Gourmet Pure Pop, the perfect vintage style accompanying pop corn bowl!